Residential electricity consumption rises and falls seasonally substantially more than commercial or industrial consumption, largely because of air conditioning use in the summer. According to the most recent data from EIA’s Residential Energy Consumption Survey (RECS), nearly 9 out of 10 U.S. homes are air conditioned by central units, individual (window, wall, or portable) units, or both. Other activities, including use of fans, dehumidifiers, and pool pumps, also increase summer electricity use in homes. Typically, monthly home electricity consumption peaks in July and August when temperatures and cooling demand are the highest. EIA estimates that 18% of annual household electricity use is for air conditioning. 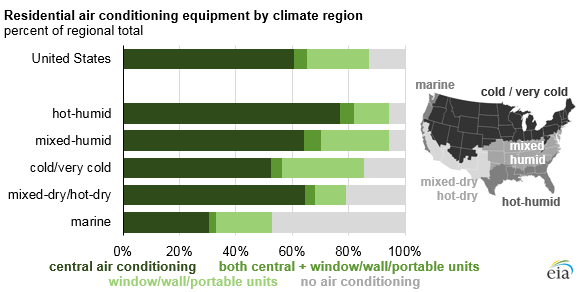 Three-quarters of all air-conditioned homes use central equipment, but individual air-conditioning units are more common in the cold/very cold climate region in the northern United States and the marine climate region along the West Coast. Individual air-conditioning units are more common in mobile homes and apartments than in single-family homes, and they are also common in older homes where it may be more difficult or expensive to add a central system and the ductwork most central systems require. Some households use fans, dehumidifiers, or evaporative coolers to maintain comfortable temperatures instead of, or in addition to, air-conditioning equipment. Nationwide, 87% of homes use fans, which are equally common in homes with and without air conditioning. 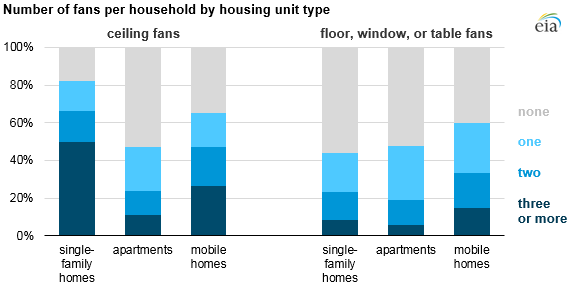 The average U.S. household that uses fans has two or three ceiling fans and one floor, table, or window fan. Ceiling fans are most common in single-family homes, while floor, table, and window fans are most common in mobile homes. Dehumidifiers are primarily used seasonally in the cold/very cold and mixed-humid climate regions: about half of the homes that use dehumidifiers do so for no more than four months per year. While dehumidifiers are used in 15% of homes with air conditioning, almost all homes with a dehumidifier also have air-conditioning equipment (93%). Evaporative coolers (also known as swamp coolers) are used in only 2% of homes nationwide, most commonly in dry, arid states in the Southwest. About half of homes with evaporative coolers do not have traditional air-conditioning equipment. The energy-consuming equipment associated with maintaining private swimming pools represents a large share of summer energy use for the relatively small share of homes (7%) that have them. In total, the average residential customer in the United States used about 11,000 kilowatthours in 2016, but pool pumps alone can use thousands of kilowatthours each year. Households can reduce pool pump energy use by choosing a variable-speed pump or by installing a timer. Four states (California, Washington, Connecticut, and Arizona) have state-level efficiency standards for pool pumps. Heated pools are a relatively minor contributor to residential summer electricity demand. Only one-third of home pools are heated. Moreover, natural gas is the most common fuel used to heat pools in the United States, and only 9% of homes with swimming pools are heated with electricity. More information about household energy use is available from EIA’s Residential Energy Consumption Survey.